Quite why Martin Luther chose to protest against Tetzel and his sale of indulgences on All Hallows’ Eve is unknown, unless it was simply a marketing decision to ensure that his 95 Theses were read by as many as possible on one of the busiest Holy Days of the year. But on 31st October 1517, the world was introduced to what became known as ‘Protestantism’, and Christendom was torn assunder. Luther railed against the extravagances of the Roman Catholic Church, “whose wealth today is greater than the wealth of the richest Crassus”, he wrote. He repudiated purgatory and indulgences, insisting that salvation is by faith in Christ alone. It was certainly not for sale, and the Pope of Rome had absolutely no authority to absolve buyers from anything they justly had coming to them by faith. The protest spread throughout Germany, and reached France, Italy and the shores of England. Thanks to the advent of the printing press, tens of thousands would go on to read On the Babylonian Captivity of the Church, and On the Freedom of a Christian in Luther’s own time. And today we remember this. 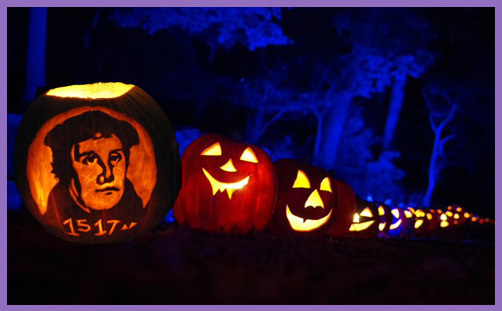 One might hope that the United Kingdom would commemorate the 500th anniversary of this momentous event in 2017 (if, indeed, the Kingdom is still united two years hence), but until then we’re stuck with pumpkins, skeletons, witches and trick-or-treating. Hallowmas has been stripped of its Christian origins and the festival has returned to its Celtic pagan roots. And yet the collecting of ‘soul cakes’ and the ringing of bells for the departed in purgatory are as pointless as Tetzel’s indulgences. One wonders what Luther would now make of it all. The Christian response? Well, you could ignore it, like all but the most devout Christians do All Saints’ Day. You could carve out a Jesus pumpkin and witness to the trick-or-treaters that salvation is to be found in Christ alone and they’re going to hell if they continue to consort with the Devil and Harry Potter. Or you could participate in the cultural phenomenon, for a candle in a pumpkin is not an invocation to the demons of hell. One wonders if he holds the same generous view of those children who hold Reformation Parties, re-enact the 95 Theses with Playmobil, or dress up as Luther, Zwingli, Calvin, Foxe, Huss, Knox or Archbishop Cranmer himself to celebrate Reformation Day. Is there any harm in that?